Anneli Olausson is a student at the University of California, Santa Barbara, and an ISA Featured Blogger. She is currently studying with ISA in Meknes, Morocco. Welcome to the blue city! Despite it being our first weekend in Meknes, a few friends and I decided to venture out to a town in northwest Morocco called Chefchaouen. It’s not that I wouldn’t have been happy to spend the weekend in our new home of Meknes, but after this past whirlwind weekend of traveling and sightseeing, my wanderlust had continued to grow. This is how I found myself at the Meknes bus station at 6 o’clock on a Saturday morning. The bus ride to up to Chefchaouen was an experience in itself. Unlike American buses, we stopped for new passengers in the middle of agricultural fields and on the sides of barren hills, and sporadically throughout the trip the rear door would be open while we were driving with new passengers hopping aboard. However, these quirks just added to our Moroccan immersion, and when paired with the beautiful scenery and a view of a lunar eclipse, our journey to Chefchouen was as pleasant as a 5-hour bus ride can be. The old city medina was just a quick taxi ride away from the bus station, and as we descended into the valley, I began to spot Chefchaouen’s signature blue hue. Houses, walls, even trees are all painted various shades of blue yearly, creating a mesmerizing maze of souks within the medina. 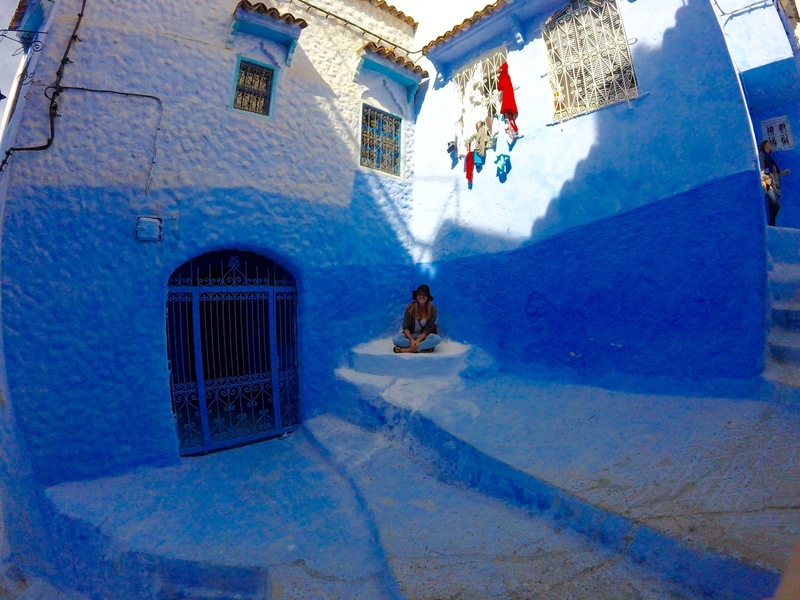 I soon found out that Jewish refugees started this tradition, unique to Chefchaouen, in 1930 to symbolize the sky and heaven, and ever since then the color has stuck. 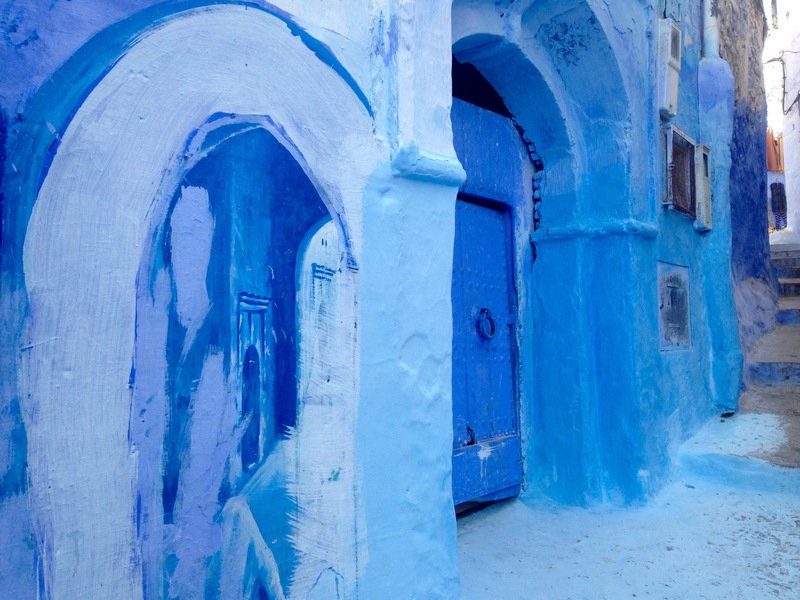 Now called “the blue city,” Chefchaouen offers endless narrow alleyways painted various tints of blue, each street or doorway a prime photo op. We arrived at our hotel, which was just as picturesque as the city itself. After a quick check in and change of clothes we took to the streets to see this blue city for ourselves. 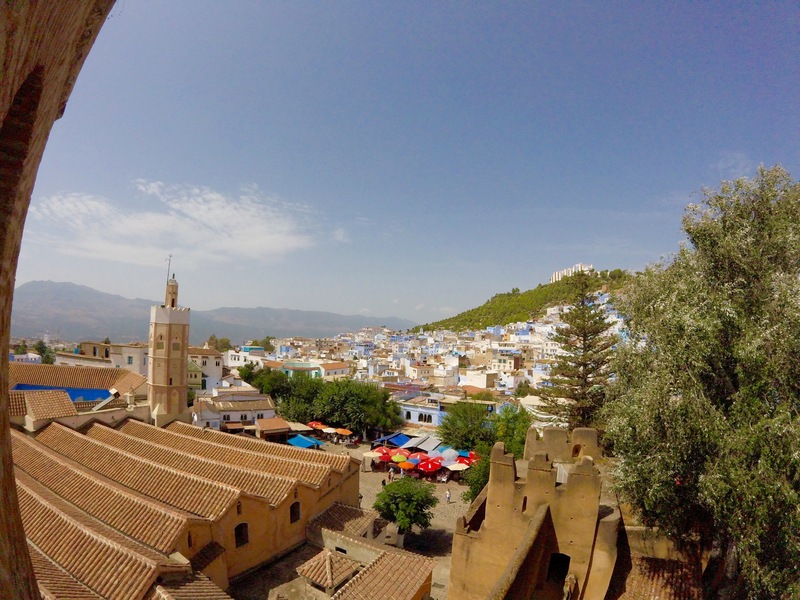 A view of the Chefchaouen overlooking the main square and surrounding neighborhood with the blue buildings starting to come into sight! Some local art within the medina. Playing tourist for the day! Immediately the small, winding alleyways reminded me of those on the Greek islands, but instead of the famed white walls of Santorini and Mykonos, blue overtook the city. 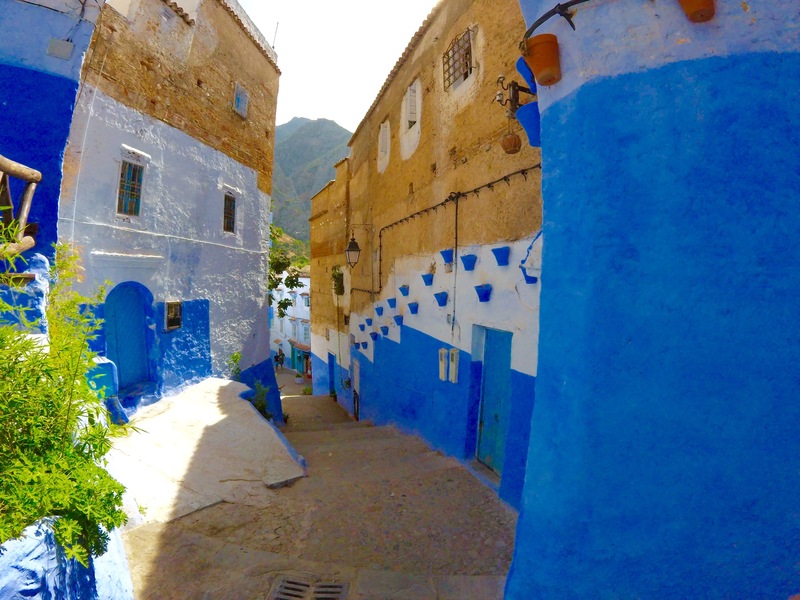 While Chefchaouen is a relatively touristy city, it is not hard to stumble upon the residential areas. 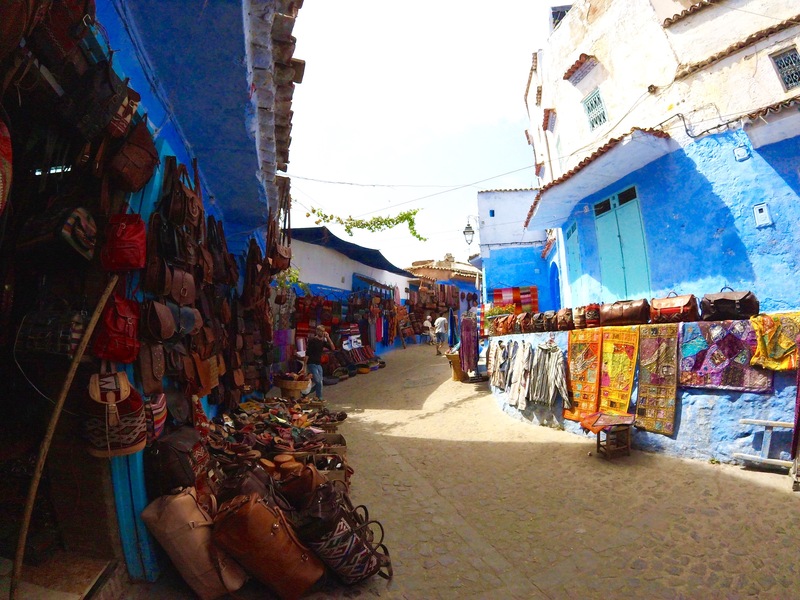 In the medina, the neighborhoods are much quieter, creating a somewhat surreal experience of wandering through a silent, blue world. It is a world I could get use to. 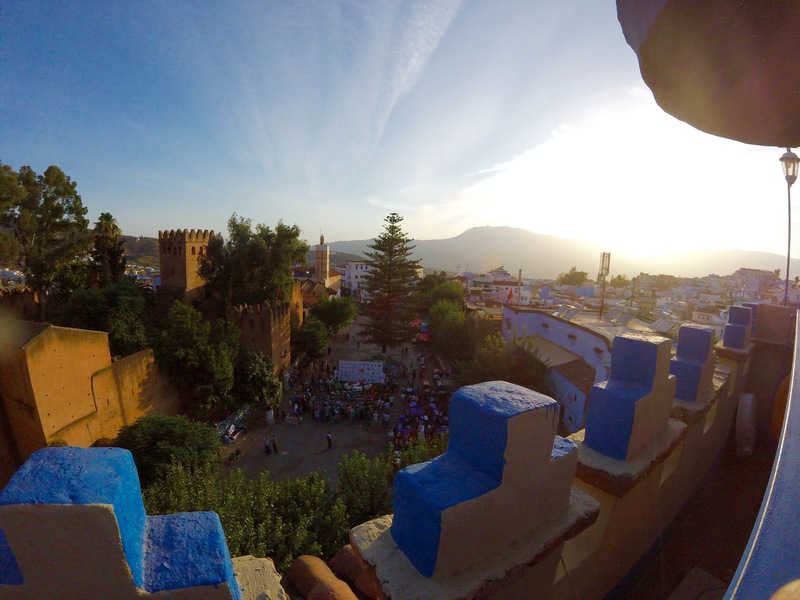 During the day, we had a chance to explore the historical Kasbah, practice our haggling for some scarves, and have tea on a beautiful rooftop terrace overlooking the festivities of the medina at sunset. I highly recommend Chefchaouen for a weekend trip; not more than a full day or two is needed to explore, but it is well worth your time! Just a small example of all the great leather goods and tapestries for sale. A view of the main square of the medina around sunset. Sipping Moroccan mint tea at sunset while hearing the call to prayer was a memorable experience! Want to see more of beautiful Morocco? Check out “Video Blog: Life in Meknes, Morocco“!